The Law Point hosted an exclusive consultative conference today at the Walchand Hall, Indian Merchant Chambers at Churchgate, Mumbai from 3:00 PM to 6:00 PM. 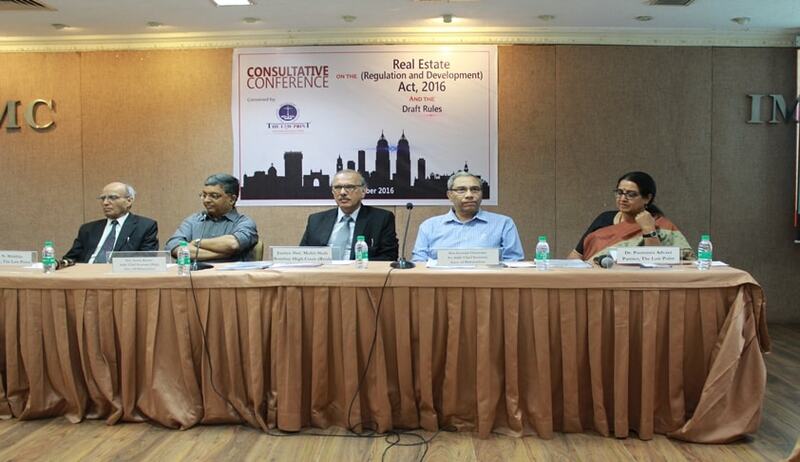 The conference was necessitated by the promulgation of the Real Estate (Regulation and Development) Act, 2016 (RERA) by the central government and thereafter the release of the draft rules by the state government on the 9th of December, 2016. The Maharashtra government has kept the 23rd of December 2016 as the last date for submissions of comments and observations by the public and thus a short period of 14 days has been provided for the various stakeholders to review and make substantive comments on the draft rules. The Law Point has been interacting with numerous stakeholders during this period and took the lead in convening this consultative conference to consolidate comments and observations on the rules to ensure that the representation that ensues, fairly represents the sentiment of a larger panel of experts. Today’s Consultative Conference was presided over by Former Chief Justice Mr. Mohit Shah and addressed by Senior Advocates Mr. Shekhar Naphade and Mr. Pradeep Sancheti along with developers, agents, consumer forums as well as senior experts who have been integral to the drafting of the rules in question. Mr. Sanjay Kumar (Additional Chief Secretary, Housing Department, Government of Maharashtra) in the inaugural session stated the government should be able to notify the final Rules and come out with a formation of a Regulatory body in another two to three months. He commended TLP for the initiative and stated that such consultative discussions help the government immensely in understanding of the views and expectations of the various stakeholders in the industry. Mr. Naphade and Mr. Sancheti, Sr. Advocates, analysed the Act and the Rules threadbare and pointed out areas of conflict with existing legislation and other inadequacies based on the experience of other regulatory laws. Mr. Niranjan Hiranandani, MD, Hiranandani Estates, spoke out in support of regulation in the real estate sector, provided that the contours of the compliance regime under the RERA is more streamlined and made business friendly. While speaking on the issue of regulation vis- a-vis safe housing, he said, “It will be a wonderful day when regulation is not strangulation but promotional”. The Chairman of the Mumbai Grahak Panchayat, Mr. Shirish Deshpande, stated to great applause that there were certain gaping loopholes and striking lacunae in the Act and Rules, including the provisions regarding registrations of developers and projects, qualifications for developers. The Law Point Senior Partners, Mr. BN Makhija and Dr. Poornima Advani have a rich history of participating in legislative and policy discussions during their many years of working with the government as the Principal Advisor of the erstwhile Planning Commission and Chairperson of the National Commission for Women respectively. They along with rest of the advisors and team at The Law Point were present to facilitate the discussions putting into use their extended experience in the real estate sector as well as their policy, regulatory and legislative expertise.